With all the Tibetan culture, monks, food and prayer flags around McLeod Ganj, it’s easy to forget that we’re still in India. Mutton was my first non-vegetarian meal after more than a month of living in the meat-free town of Rishikesh. It wasn’t very good, but at least my stomach was ok.
Momos are Tibetan dumplings. Available either fried or steamed, you usually can get 6-8 of them on the street for 20 rupees (40 cents). Meanwhile, the same quantity costs at least triple that in one of McLeod Ganj’s numerous restaurants. Oh my God! That was my reaction after a little old woman in a restaurant pointed her cane at Carrie’s shoulder. Why? To show us the giant spider crawling up it. Welcome to the mountains. As McLeod Ganj is built on the mountainside, we spent a LOT of time walking up and down steep hills and lots of stairs: like the 300 that separated our guesthouse from the main road. 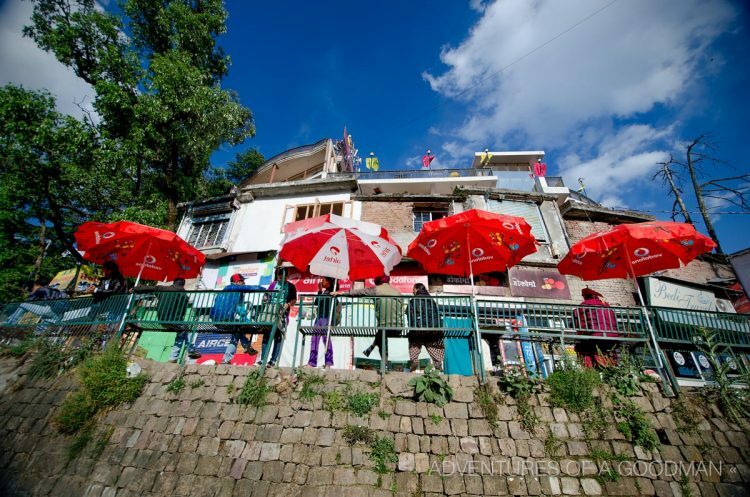 There is ZERO attempt at hiding the pipes that transport water to every corner of McLeod Ganj. I think it’s a miracle that dumb tourists don’t accidentally step on and break them every day! One of the largest draws of McLeod Ganj is seeing the Dalai Lama, who calls the town home. Sadly, he was away in America while we were visiting, though we did get to see his home and temple. There are lady bugs everywhere in Bhagsu! Lots of goats too. I became obsessed with the idea of driving a tuk tuk to Delhi after seeing one for sale in Bhagsu. A few weeks later, I would have the opportunity to actually live that dream, though only for a few hundred feet down an empty road in Agra. The night of the Supermoon, we felt an earthquake, witnessed a hail storm and saw intense lightning. End of the world? It rained most days. Sometimes it lasted for hours. Other afternoons, the sky went dark and stormed for 30 minutes or so before the sun returns. Either way, it kept the town nice and cool. Thanks to our time studying Iyengar yoga in town and living in Rishikesh, we frequently ran into people we knew while wandering around Bhagsu. It felt like we were a part of a community, which was quite nice. At night, Bhagsu gets quite cold. It’s amazingly tough to get good Indian food in Bhagsu. This is probably because the town is geared towards tourism and most restaurants dull down the spice to appease Western taste buds. Our first night in town, we were lucky enough to have a giant jam session break out around us. I can’t count how many hours we spent just relaxing and eating on pillows on the floor at one of Bhagsu’s many continental restaurants. For two hours, Carrie and I jumped, danced, crawled, wiggled and moved our way across a room during a Five Rhythms workshop. The idea is to dance continuously to a variety of music in five different styles. There is no right or wrong step: whatever comes naturally to you is the right move. I’ll be honest, when the music started and people began crawling around on the floor, I almost left out of sheer embarrassment. But once I let go of my inhibitions, I was amazed to find myself dancing, leaping and wiggling around the room to my own rhythm and beat. Five Rhythms turned out to be an inspirational experience and one I recommend for everyone. One night, we stumbled upon some sort of award ceremony. An entire Indian family sat in front of a stage, while various local singers came up to serenade them. Meanwhile, rows of seats were filled with friends, locals, Indian tourists and backpackers alike: all watching the ceremony. At various times, waiters came around with free coffee and hot chocolate for everyone. During the course of the ceremony, different men were called up to the stage and received golden medals that reminded me of those given out at a high school track meet or field day. Best of all, these awards/medals had the recipient’s face on it! Despite asking around town, I still have no idea what the ceremony was for. All I know is, it seemed like the proudest day of the recipients’ lives…and I was thrilled to be there for it. After no more than 15 minutes of getting to know the chana masala (seasoned chick peas) street vendor, he offered to take us to his home, meet his family and remarry us in the Indian way. Unfortunately, he also tried to skimp us on our change on two different occasions. That, and a few other negative moments over the weeks, convinced us to not take him up on his offer. Below is a view from the seat inside his food stall. Yup. It’s rope in a wall.